From 1 to 1:30, in Director Park, downtown Portland (Taylor and Park, across from Fox Regal Theatre and Elephants Deli). We will meditate for half an hour on the metta phrase, "May all beings be safe." 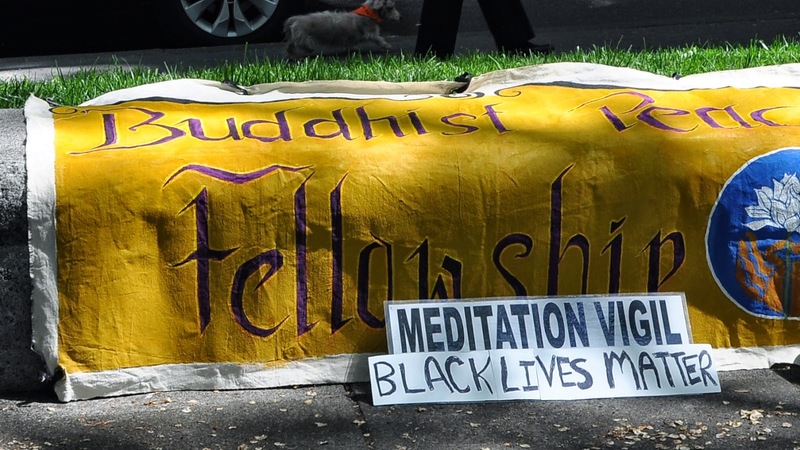 Our Sunday meditations are conducted in solidarity with #BlackLivesMatter. Buddhist Peace Fellowship of Portland will be joining the May Day rally which meets at the Smith Memorial Student Union at Portland State University in the South Park Blocks. Gather from 2 p.m., Rally at 3 p.m., March at 4:30 p.m. During the march, those who are able and willing to march, will march. Those who prefer to meditate rather than march, and those cannot march because of health, physical ability, or any other reason, will meditate in the park during the march. We stand, sit, and walk in silent meditation for the benefit and safety of all beings.